Members of the Legislative Assembly have been debating the 2019-20 Provincial Budget – a responsible and sustainable plan to balance the budget this year, and in the years to come. The debate, however, brought forward some questionable remarks from the NDP’s newest MLA who defended the former government’s closure of 176 schools and 52 hospitals by saying “maybe those places should have been closed”. He even suggested that our protective services “don’t prevent crime”, they only respond to it. While these comments are completely out of touch with Saskatchewan, perhaps they shouldn’t come as a surprise from the same group of people who have supported the Trudeau carbon tax from the very beginning. 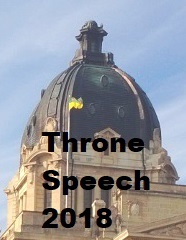 Your Saskatchewan Party MLAs are fighting the federal carbon tax and standing up for Saskatchewan by putting forward and passing a budget that strikes the right balance between keeping taxes low and providing quality services for our children, families, and seniors; important investments in urban and rural Saskatchewan; and for building our economy and creating jobs. One of the highlights in this year’s budget is our commitment to improving mental health services across the province. Funding for targeted mental health and addictions initiatives increases by nearly $30 million, representing the largest ever commitment to mental health services in Saskatchewan. Another highlight is a $100,000 commitment to Legions and ANAVETS branches across Saskatchewan to assist the important work of supporting veterans and honouring the memory of our fallen heroes. Details on the program and application process are being finalized with guidelines to be announced later this spring. The new provincial budget is the right balance to keep our province growing and our economy strong. I encourage you to visit saskatchewan.ca/budget to learn more about our balanced budget with no new taxes or tax increases; a budget that invests in health care, seniors, students and classrooms, and vulnerable families; a budget that’s focused on safety and investments in infrastructure; and a budget that strikes the right balance for Saskatchewan. The Government of Saskatchewan appreciates the commitment and sacrifices of Canadian Armed Forces veterans and will be offering hunting and angling licences at no cost to recognize their contributions. The new initiative applies to veterans who were honourably discharged from the Armed Forces and is available to Saskatchewan and Canadian resident veterans. More information on this opportunity, including eligibility requirements and how to apply, can be found here or by calling the Ministry of Environment Inquiry Centre at 1-800-567-4224. Melting snow and rising temperatures give us reason to believe we’ve put a long and cold winter behind us. It also means it’s time to start planning for recreation and relaxation in Saskatchewan Provincial Parks. Campsite reservations for the 2019 season begin on Tuesday April 2 at 7:00 a.m. with seasonal bookings. Reservations open at 7:00 a.m. on April 4 for group camping sites, and April 8 to 18 for nightly sites. Due to high demand for these sites, a queuing system will be used to ensure a fair process. For a smooth booking process, campers are urged to create a new account and become familiar with the new system prior to reservations opening. All reservation information, including tutorials for creating a new account, are available at saskparks.com. If you have a question about this Legislative Report or any other matter, just Contact Don.